Be one of the select few who will take part in this year’s biggest SME meet-up in Singapore! FOR FREE! 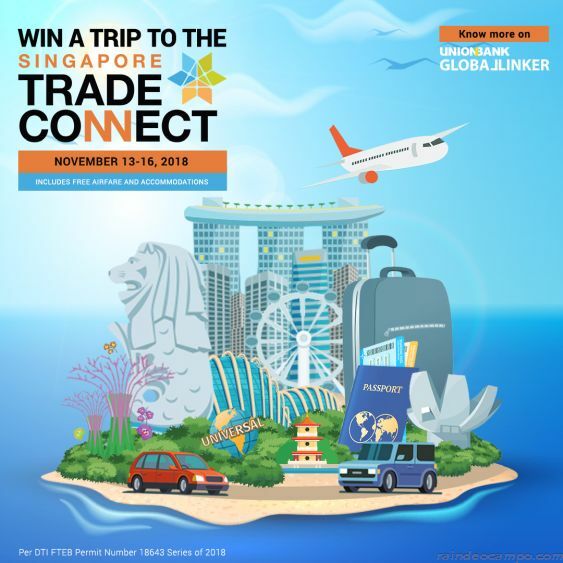 An international networking opportunity Singapore Trade Connect, which coincides with the Fintech Festival and includes in-depth learning sessions on digitization and cross-border trade, is currently up for grabs in a raffle by UnionBank GlobalLinker, UnionBank of the Philippines’ free digital platform for Micro, Small, and Medium Enterprises (MSMEs). The raffle’s 25 winners will receive round-trip airfare tickets and a three-night hotel stay for the Singapore Trade Connect Cross Border Trade and Learning Meet Up, which is set on November 14. Hosting this event is one of UnionBank’s most recent efforts to empower MSMEs, which make up 99.57 percent of Philippine establishments. According to UnionBank Vice President and UnionBank GlobalLinker lead proponent Dino Velasco, UnionBank is redefining its role as a financial institution so they can provide MSMEs with other essential resources to succeed, including digital tools and knowledge-building activities. To be eligible to join the promo, business owners should sign up on UnionBank GlobaLinker and register as a participant. Using the platform’s different features and functions, such as sending invites, joining discussions, publishing articles, will earn participants a corresponding number of entries. Other ways to earn entries include the availing of special deals from the Biz Offers section and building an e-commerce site using the LINKER.store feature. The promo period runs until October 30, 2018. Winners will be notified via email, SMS, UnionBank GlobalLinker, and UnionBank’s social networking sites. Sign up on unionbank.globallinker.com or download the UnionBank GlobalLinker app for more information.